No one will be able to come to this wedding. Sure, we haven’t even set a date or found a venue or sent out invitations, but we’re fairly convinced that no one will show up. Joe and I will plan for a big amazing wedding and everyone will decline the invite, or they’ll show up and hate us for making them do it and everything will be terrible and let’selopeohmygodIcan’tbreathe. So, yeah. Drama. Mostly exaggerated drama, but drama nonetheless. The reason for the worry is this: we live in San Francisco, but nearly everyone we know lives in the Midwest, where we grew up and lived until we moved to California two years ago for work and adventure. So a San Francisco wedding is essentially a destination wedding for our family and friends, and spending hundreds of dollars for a weekend trip is not easy. Besides the cost, many of our friends have small children. And the ones with a little more money and time to spare? They already spend all that money and time on flights for their friends’ weddings (Hi, my name is Emily, nice to meet you) and our wedding may be the straw that breaks the camel’s back. 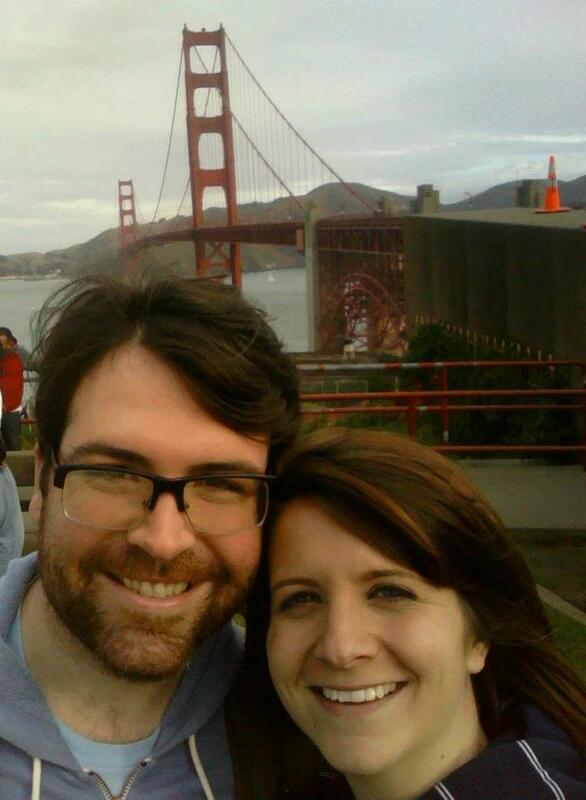 So the million-dollar question has been: do we have the wedding in San Francisco? Or do we have it in Chicago? Or to put the question another way: do we make this wedding easier on us, or on everyone else? A wedding in Chicago means our family and friends can drive from their homes in Illinois, Ohio, Indiana, Wisconsin, and Michigan without taking a day off work. They can bring their kids or leave them with a babysitter. Those who can’t afford a pricey plane ticket can still come. We’d see more family, more friends, and we could have a This Is Your Life wedding surrounded by nearly everyone who’d ever mattered to us in our lives. A wedding in San Francisco means control over our wedding decisions. It means a beautiful setting. It means more predictable weather. It means sane planning with vendors we can meet in person. It means no extra flights to Chicago to plan the wedding. It means a more manageable guest list, but that guest list will likely have some very notable people missing from it. The reason this issue is causing us drama is because Joe and I are both people-pleasers. Our living nightmare is finding out that someone is disappointed or upset with us. It’s the reason I don’t play sports, and the reason he overanalyzes every party he hosts. We always want everyone to be pleased with us. But at what point do we stop trying to please everyone and do what feels right for us? While working through our options, we dug deeper into our desire to have the wedding in San Francisco, and here’s what we realized: besides the beautiful setting and easier planning, San Francisco is our home. It’s our life, and we want to share it with the people we care about. We want to give people a reason to come out here and find out what California is really like (hint: the whole state is not a sunny beach filled with celebrities like I used to think), and to experience what our lives are really like. We want to show them why we’re happy, and what that means for us. We want them to smell the eucalyptus trees in Golden Gate park, and see how the Golden Gate bridge looks while you’re crossing it. We want to show them how hilly it can be (and let them notice how it’s actually not that hilly sometimes). We want them to experience a sing-along at the Castro theater and the candied bacon at Mission Beach Café. We want them to commiserate with us when we talk about driving down 101 and marvel at how easy it is to get to Napa. We want to give them tours of the amazing companies that have embraced us. If it takes a village to raise a child, we want to show that village that their hard work has paid off, and to thank them for bringing us to this point in our lives. We want the people who mean the most to us to be able to picture our lives when they think of us, and know they leave us in good hands. So we made a decision: we’re getting married in San Francisco. We hope our village can join us, but for the ones who can’t? We’ll find a way to visit them and celebrate another time. We owe them at least as much. This entry was tagged San Francisco, wedding drama, wedding planning, weddings. Bookmark the permalink. I am sitting here with my love, Steve, and we are crying reading your post. We are so proud of you and your love, Joe (in case you didn’t know who it was). Your decision, while it doesn’t even NEED any explanation, is so well thought out and heart warming that it just makes us love who you are even more. You are building a lovely life together in CA. Folks will be blessed to share this with you. You are a vey special lady who is thoughtful, considerate and a self-described “people pleaser”, but you just have to please each other. You are a family….the 2 of you. A very beautiful family that we are so blessed to share paths and memories with. This is YOUR life and YOUR story. Location, location, location…………..wherever you 2 are together……….HOME..
P.S. We have air miles…………………..